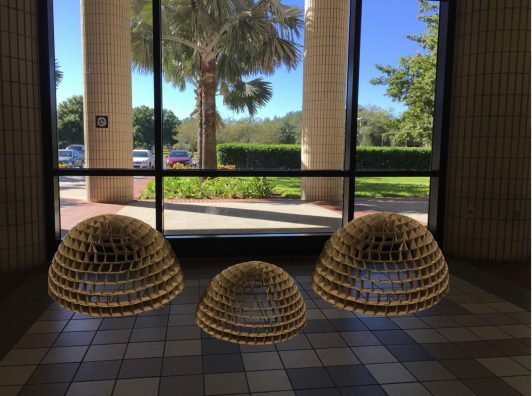 Three domes created by student Savannah Kloess from disposable coffee cup sleeves will be on display in the Visual Arts Building. Keep your eyes and ears open Wednesday and Thursday around UCF’s main campus – you just may stumble across some pop-up displays that are part of the national Art in Odd Places event. The art is created by students under the guidance of professors across several College of Arts & Humanities disciplines. The do-not-touch-the-artwork mentality is strong in traditional venues, but putting art elsewhere exposes it to broader audiences. Art in Odd Places is an annual art festival started two decades ago by artist Ed Woodham in New York. This will be the first time UCF has participated, and organizers hope it becomes a tradition. Woodham, who has been active in community art, education and civic interventions for more than 25 years, will be on the UCF campus Wednesday to talk about the national project and his engagement with the urban environment. He will speak at 3 p.m. at the UCF Art Gallery in the Visual Arts Building. Art in Odd Places also coincides with the annual School of Visual Arts & Design faculty exhibition, which will open at 5 p.m. Wednesday.